Fontenoy-le-Château is located about 30 km south of Epinal at the Canal des Vosges. It is a medieval village with that typical French charm. There is a small port from which one can hire house boats. A stream that comes down from the Vosges accompanies the canal through the village. The valley is enclosed by a beautiful forest. 'L´Ecluse' is situated in a quiet living area facing the 'Canal des Vosges'. It is comfortable and well equipped. The upper level of the holiday flat is constructed in the form of a large open plan studio. Kitchen, living room and eating area are integrated on this floor. Furthermore there are three bedrooms, 2 bathrooms, a roof balcony and an amazing view from the garden over the village and the canal. Electric heaters are provided in each room and in the hallway. Electricity used during the visit will be charged and taken from the returnable security deposit. *Electricity is expensive in France. Beds are provided with a mattress protector, duvet and pillows. On request, bedlinen (sheets, duvet covers and pillow cases) and towels will be provided at a cost of 15 euros per person. A washing machine is located on the ground floor of the house and is available for guests to use. Washing liquid is provided. There is also an iron and ironing board available for guests to use. A tumble dryer is located on the ground floor and is available for guests to use. There is also a clothes drying rack located here and a rotary clothes dryer on the first level of the rear terrace. Provides storage for 7 bicycles which may be used by guests and for the storage of wood for the wood burning stove. 1 Gigabyte per week internet provided. More available at additional cost. Provided on request. See linens. Guests may, of course provide their own towels and bedlinen. A large 3 seater cottage style settee and 4 armchairs are provided in the open plan living/dining/kitchen area. A television and DVD player, coffee table and floor lamp are located here. Large family sized dishwasher. Dishwasher capsules provided. Assorted stainless steel saucepans and lids, teflon and stainless steel frying pans with glass lids, 3 tier vegetable steamer, salad spinner, scales, measuring spoons and cups. A welcome pack of milk, tea, coffee and sugar as well as a bottle of wine are provided for the arrival of each set of guests. Crockery, cutlery and glassware for 10. Assorted pots, pans, baking and serving dishes. The galley style kitchen in the open plan living area is fully equipped with hob, oven, fridge/freezer, coffee maker, toaster, microwave. One of the two large work surfaces also forms a breakfast bar. A table seating up to 8 people is located in the large open plan living/dining/kitchen area at the top of the house overlooking the canal. The satellite dish provides mainly British television with several French stations. A number of DVDS (films) are available for use by guests. A number of mainly fiction books in English and in German are available for guests. There is also a large selection of information on the local area including maps to peruse. The garden consists of 4 terraces to the rear of the property. Guests are invited to use the terraces at their own risk. Beautiful views over the village are afforded, particularly from the top two. The balcony is a pleasant place to sit or eat as it overlooks the 4 garden terraces at the rear of the property. Assorted bicycles are available for use by the guests including one child's bike. Bicycle helmets are however, not provided. A small balcony is located outside the upper floor living/dining/kitchen area. It is suitable for eating or sitting. Garden chairs and table are provided and may be used there or in the garden. Behind the house of this two floor holiday flat there are four terraces that can of course be used by our guests for free but are not part of the rental agreement of the holiday flat. On the ground floor there is a garage (usable for bikes, motorbikes, dingies, etc.) that can be used upon agreement for no extra charge. Linen and towels can be provided at a cost of 15 euros per person per week. There are seven bicycles in the garage that guests can use with the owners permission. Bicycles are used at the guests’ own risk. Use of bicycles are not part of the rental agreement or covered by insurance. A fabulous holiday property, full of character with beautiful views overlooking the canal and town. 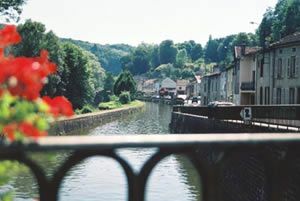 We were attracted to the property initially due to its location and picturesque views overlooking the canal. When we arrived we were shown around the house, which covers 3 floors, with the lounge and kitchen areas on the top floor. This is a wonderful bright and airy space with a small balcony which overlooks the terraced gardens. The house was very clean and has absolutely everything that you might need or want during your stay. There are bicycles that can be borrowed and we enjoyed a very pleasant cycle ride along the canal path, as well as a trip along the canal on a boat from the marina in the town. We found our neighbours to be very friendly, with advice on where to visit and information about market days etc. We discovered a bar/restaurant nearby where you could sit and have a drink and a meal, as well as enjoying a game of boules. Overall, a fabulous holiday property, where you can relax,unwind and enjoy the peace and quiet, or alternatively explore the towns and villages of the surrounding areas. The property was comfortable, immaculately clean, well equipped and we were given a very warm welcome on arrival. The village itself was charming, full of history and with a wonderful boucherie/patisserie only a five minute walk away, so perfect for breakfast. There were plenty of places to walk and bicycle to and from and was the perfect place from which to explore the Vosges region. Our group had a very happy holiday. I am so glad you enjoyed your stay in this beautiful spot. Last but not least: We were received very nicely and everything was well arranged. All in all a great place to stay. I am glad the guests enjoyed their stay and took the opportunity to explore the area on the bikes we provide. It is a wonderful house in a row of different houses build together. All is clean, good beds which is often not normal. Two perfect bathrooms with toilets on first and second floor. A big kitchen with livingroom and extra big table for having breakfast and dinner on the second floor. Big windows, so it is light in the room. A wonderful new wooden floor. A good view to the canal, only over the street. It is quite, no noise, so you can sleep very well. You can walk along the canal or use the bikes. The customer service is really good. Friends of the owner are living in the street. They are very nice people from England and they help you whenever you want..
We didn't go to a restaurant because we cooked for ourselves which is no problem in the kitchen either you are 7 persons. We can recommend this property for hundred percent. It is perfect. I wrote this in English language so that everybody can understand it from overall. I can give best notes. Wir haben es sehr genossen. Ein perfekter Platz. Das Haus ist wunderschön eingerichtet, der sehr große Wohnraum mit Pantryküche hat einen traumhaften Blick auf Kanal und Fluß. Beide Badezimmer sehr fein. Alles da, was man braucht. Gute Betten! Die Menschen am Kanal kommen aus allen Ländern der Welt und sind extrem freundlich. Der Ort ist malerisch schön auf eine morbide zerfallende Art. Interessante Orte und schöne Landschaft rundherum. A 200 EURO returnable security deposit is required on bookings (Returned within two weeks of departure date less fuel costs and cost of any significant damage to the property or its contents.) There is a charge for electricity and fuel, dependent on usage/season (10 - 80 Euros per week). There is a 10 Euro minimum charge for electricity. Wood is available at 10e per basket.